Reasonably Well: You know it's been a good day when there's blackberry frosting on your knee brace. 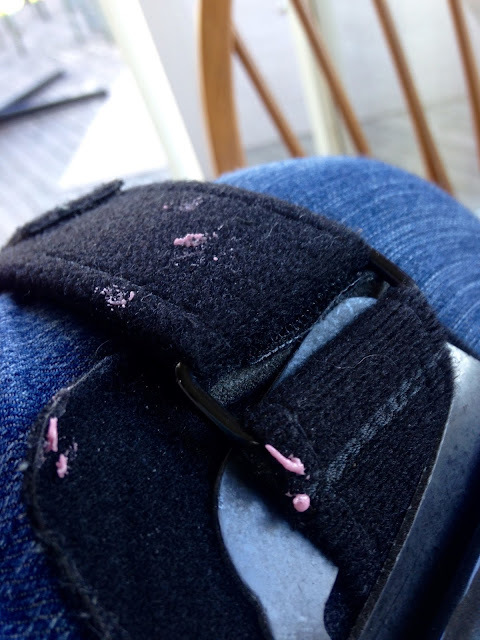 You know it's been a good day when there's blackberry frosting on your knee brace. Dang. It's hard to measure flour when you have a monster tremor. We're switching up a few of my meds for restless leg syndrome and neuropathy in my legs and feet; one of those maneuvers that require me to make a chart since some doses are tapering downwards and the other gradually rising. 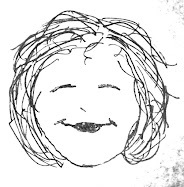 My internal medicine doctor told me frankly,"You're going to feel kind of strange for about two weeks. So hang in there. But if you feel uncomfortable just give me a call." So far the only thing that I have noticed is that my tremor - which I've had for awhile anyway - has been amplified big time. This makes measuring and sifting baking ingredients really interesting.....and has resulted in a totally trashed kitchen. 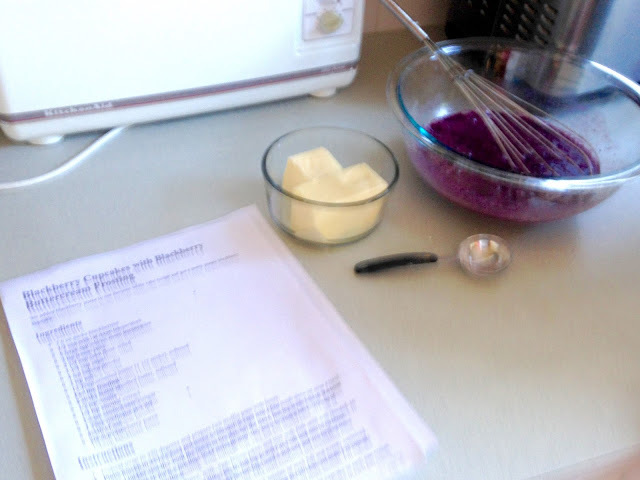 I'm making blackberry cupcakes from a recipe that I haven't tried before. I was interested because it uses blackberry puree, which I still have about a half gallon of in my freezer. If they taste good, I'll post the recipe for y'all. If the cupcakes taste as good as the batter does, this may be a keeper recipe. I started to take pictures of the process, but I was wobbling so much that the first ones were pretty fuzzy, hoo boy. Yay for balancing phone cameras on a non-tremoring surface. Sorry about the tremor. Been there. 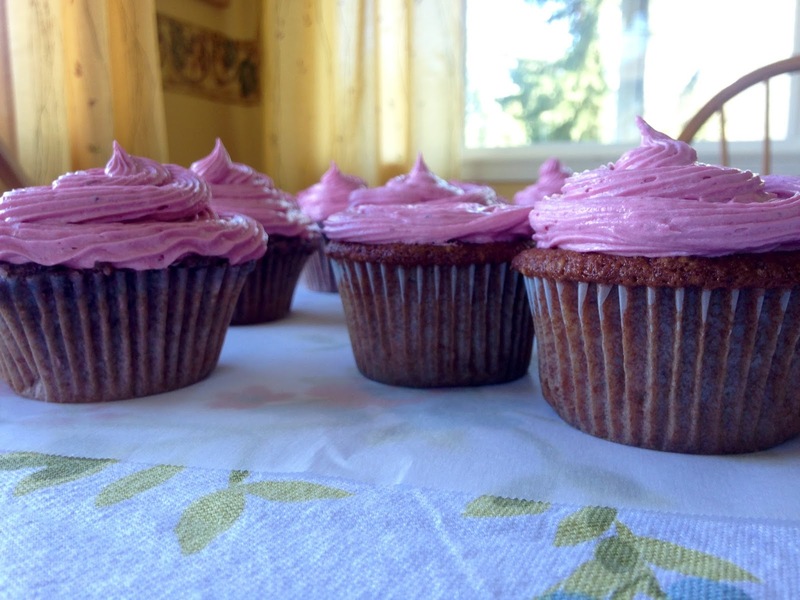 Those cupcakes look marvelous. AND they are purple to boot. Hugs. We do a lot of "waiting for 2 weeks" until our bodies adjust to this and that. I hope that your body takes the new treatment well. At least you got some baking in. Love to bake. I bet your place smells lovely!